"Armée de Terre" redirects here. For the cycling team, see Armée de Terre (cycling team). 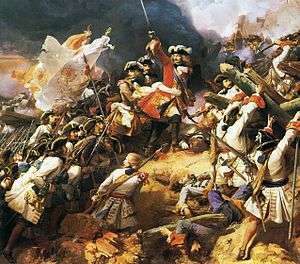 The French Royal Army at the battle of Denain (1712). Henry II further regularised the French army by forming standing Infantry regiments to replace the Militia structure. The first of these the Régiments de Picardie,Piémont,Navarre and Champagne were called the Les Vieux Corps (The Old Corps). It was normal policy to disband regiments after a war was over as a cost saving measure with the Vieux Corps and the King's own Household Troops the Maison du Roi being the only survivors. 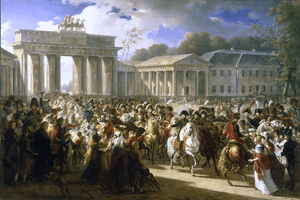 After Napoleon's abdication and return, halted by an Anglo-Dutch and Prussian alliance at Waterloo, the French army was placed back under the restored Bourbon Monarchy. The structure remained unchanged and many officers of the Empire retained their positions. In 1830 the Bourbon Monarchy was overthrown and replaced by the constitutional Orleans Monarchy, the mobs proved too much for the troops of the Maison du Roi and the main body of the French Army, sympathetic to the crowds, did not become heavily involved, desertion was rife and troops joined the crowds as they had done in 1792. While this was happening in Paris the French army was committed to an invasion of Algeria. 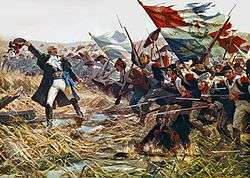 Now in Dark Blue coats and Red trousers the French troops were victorious and set the stage for French Algeria for the next hundred years. 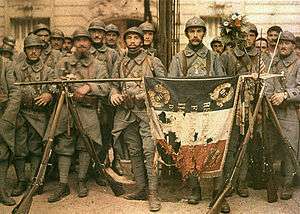 French Poilus posing with their war torn flag in 1917, during World War I (1914–18). In August 1914, the French Armed Forces numbered 1,300,000 soldiers. During the Great War the French Armed Forces reached a size of 8,300,000 soldiers, of which about 300,000 came from the colonies. During the war around 1,397,000 French soldiers were killed in action, mostly on the Western Front. It was the most deadly conflict in French history. The main generals were: Joseph Joffre, Ferdinand Foch, Charles Mangin, Philippe Pétain, Robert Nivelle, Franchet d'Esperey and Maurice Sarrail (See French Army in World War I). At the beginning of the war, the French Army was wearing the uniform of the Franco-Prussian War of 1870, but the uniform was maladapted to the trenches, and so in 1915 the French Army replaced the uniform, with the Adrian helmet replacing the képi. A uniform with a capote, of bleu-horizon colour adopted to the trenches, was adopted, and the uniform for colonial soldiers coloured khaki. At the beginning of World War II the French Army deployed 2,240,000 combatants grouped into 94 divisions (of which 20 were active and 74 were reservists) from the Swiss border to the North Sea. These numbers did not include the Army of the Alps facing Italy and 600,000 men dispersed through the French colonial empire are not included in this figure. After defeat in 1940, the Vichy French regime was allowed to retain 100–120,000 personnel in unoccupied France, and larger forces in the French Empire: more than 220,000 in Africa (including 140,000 in French North Africa), and forces in Mandate Syria and French Indochina. 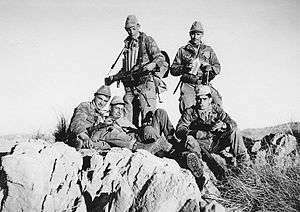 Soldiers of the 4th zouaves regiment during the Algerian War. At the end of World War II France was immediately confronted with the beginnings of the decolonisation movement. The French army was the leading force in opposition to decolonization, which is interpreted as a humiliation. 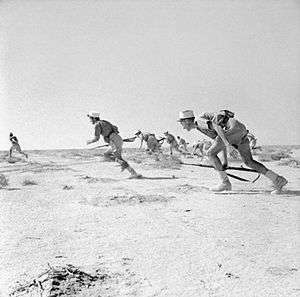 In Algeria the Army repressed the first demonstrations in May 1945 with heavy fire; 45,000 Algerians were killed. Maintaining control of Algeria, where 1 million Frenchmen had settled alongside 9 million natives was a high priority for the Army. When it decided that politicians were about to sell them out and give independence to Algeria, it engineered a military coup that toppled the civilian government and put General de Gaulle back in power in the May 1958 crisis. De Gaulle, however, recognized that Algeria was a dead weight and had to be cut free. The Army then planned a military coup against de Gaulle himself in 1961, but it failed. After 400,000 deaths, Algeria finally became independent. Hundreds of thousands of Moslems who were loyal to Paris (also known as Harkis), went into exile in France, where they and their children and grandchildren remain in poorly assimilated "banlieue" suburbs. During the Cold War, the French Army, though not part of NATO's military command structure, planned for the defence of Western Europe. In 1977 the French Army switched from multi-brigade divisions to smaller divisions of about four to five battalions/regiments each. From the early 1970s, 2nd Army Corps was stationed in South Germany, and effectively formed a reserve for NATO's Central Army Group. In the 1980s, 3rd Army Corps headquarters was moved to Lille and planning started for its use in support of NATO's Northern Army Group. The Rapid Action Force of five light divisions was also intended as a NATO reinforcement force. In addition, the 152nd Infantry Division was maintained to guard the intercontinental ballistic missile bases on the Plateau d'Albion. An ERC 90 Sagaie of the 1st Parachute Hussar Regiment in Côte d'Ivoire in 2003. The French Army was reorganized in 2016. The new organisation consists of 2 divisions (the "Scorpion Force"). EMF 1 and 3 were redesignated divisions (carrying the heritage of 1st Armored and 3rd Armored divisions) and given three combat brigades to supervise each. There is also the Franco-German Brigade. The 4th Airmobile Brigade was reformed to direct the three combat helicopter regiments. There are also several specialized commands (including Intelligence, Information and communication systems, Maintenance, Logistics, Special Forces, French Army Light Aviation, French Foreign Legion, National territory, Training). The Troupes de marine are the former Colonial Troops of the French army. They are the first choice units for overseas deployment and recruit on this basis. They are composed of Marine Infantry (Infanterie de Marine) (which includes parachute regiments such as 1er RPIMa and a tank unit, the RICM) and the Marine Artillery (Artillerie de Marine). 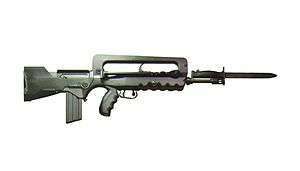 The FAMAS is the service rifle of the French military. In the 1970s France adopted a light beige dress uniform which is worn with coloured kepis, sashes, fringed epaulettes, fourragères and other traditional items on appropriate occasions. The most commonly worn parade dress however consists of camouflage uniforms worn with the dress items noted above. The camouflage pattern, officially called Centre Europe (CE), draws heavily on the coloration incorporated into the US M81 woodland design, but with a thicker and heavier striping. A desert version called the Daguet has been worn since the First Gulf War which consist of large irregular areas of chestnut brown and light grey on a sand khaki base. Gendarmes of the Republican Guard retain their late 19th century dress uniforms, as do the military cadets of Saint-Cyr and the École Polytechnique. A medium blue evening dress for officers is now seldom seen but individual branches or regiments may parade bands or "fanfares" in historic dress dating as far back as the Napoleonic period. 1 2 "Key defence figures 2015" (PDF). Defense.gouv.fr. 3 September 2015. ↑ Jacques Marseille, " L'Empire ", dans La France des années noires, tome 1, Éd. du Seuil, rééd coll. " Points-Histoire ", 2000, p.282. ↑ Isby and Kamps, 1985, 106. ↑ Collectif, Histoire des parachutistes français, Société de Production Littéraire, 1975, 544. ↑ Colonel Lamontagne G, CD, accessed June 2013. ↑ In 1986, the 109th Infantry Division was restructured into the 109th Brigade de Zone. In 1992, as part of the " Armée 2000 " plan, the brigade became the 109th brigade régionale de défense (109th Regional Defence Brigade). ↑ French Army Terre magazine, 1998, see III Corps (France) article for reference. ↑ "Version du décret avant abrogation" (in French). Legifrance.gouv.fr. Retrieved 2013-01-25. ↑ Charles R. Shrader, The First Helicopter War: Logistics and Mobility in Algeria, 1954–1962, Greenwood Publishing Group, 1999, 28–31. ↑ Isby and Kamps, Armies of NATO's Central Front, 131–133.